"Slowly the door opened where the good doctor was standing, completely oblivious to the surrounding storm that gathered just outside his laboratory. The ominous clouds surging with brilliant flashes of lightning which were the necessary power energy sources he needed to complete his experiment, bringing the gigantic monster to life was the only thought going through his brain now. Another streak of light shown through the laboratory windows and he counted to 10 under his breath, then threw the first switch which caused the amplidyne generators to roar to life. The deafening whirl of the machinery increased exponentialy while the perfect storm raged on when suddenly, without warning, a bolt of high energy lightning streaked across the roof of the laboratory until it found its mark on the energy collection antennae high atop the roof, sending its 21 gigawatts of power thru the cables to the amplidyne generator turning it into a useful stream of life giving electrons traveling along the massive stream of cables and wires to the lifeless hulk of a machine. The LSR bike bucked and heaved it's chest until finally, life had grown on it's own and it breathed it's first gulp of air thru it's turbo..." Wait a minute, thats a whole nuther story. let's get on with the real picture here. You would think I was a novelist. 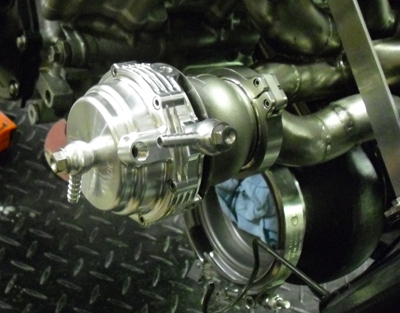 As you can clearly see, this particular turbo, a Schwitzer S300, has been fitted with EGT's on every port to be used for tuning and data collection during the runs. 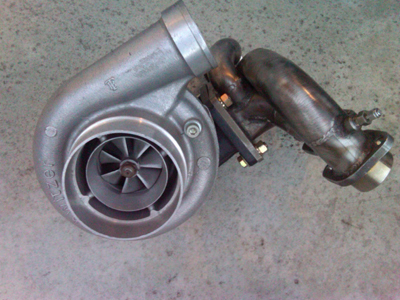 This turbo should produce anywhere from 500 - 800HP depending on the boost pressure. Tiger Racing wants to thank John Noonan of Noonan/Derwin Racing for giving us a proven dynoed 685HP turbo to use for our LSR speed attempts. I know she doesn't look like much now, but after we rebuild her and install new bushings and ceramic bearings, clean up the housings and install it on to the "Flying Tiger's" head, you will see a performance driven machine start to take shape. Some of you may have already guessed that this Schwitzer S300 is normally found on Turbo diesel motors. Yep, it is, so what. Its big, bad and beautiful, just what the race doctor ordered. Now thats a ton of Horse Power to play with. Since we will have the ability to go all the way up to 80lbs of boost (yeah, right, like I would use that much) I'm sure we will have enough power to make the 300mph dream run a reality sooner rather than later. 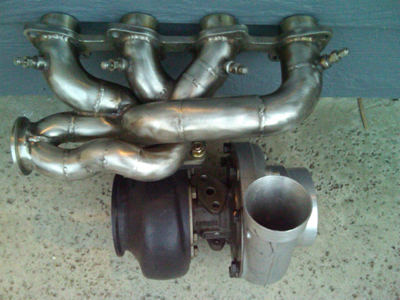 This turbo is a thing of beauty and elegance! The intake side has a port that I will use for the nitrous jetting. Oooops, did I spill the beans? 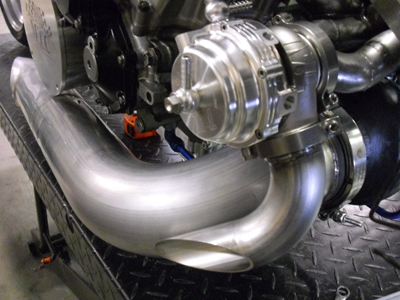 You can already tell that this turbo is different than most you have seen on any other bike. The custom header pipe had to have been a nightmare to weld up in this configuration. Did you know that we designed this bike around the turbo? No? Well we did and one of the reasons for the long custom chassis was to allow for a totally and more radical way to get the front end "out there" and increase the rake by 5 degrees. We also created a massive amount of space in front of the radiator allowing the body work to be designed with more aero qualities that a short front end doesn't allow for. Many friends have asked why we don't use that space for the intercooler and my answer to that is "That's why they invented Nitrous Oxide" and besides, the area for the custom aero body work by Airtech is needed up front. Now at this point in the article my turbo friends are rolling their eyes and saying under their breath "it'll never work." Maybe, then again most everyone who innovates and goes beyond what is expected usually has a handful of naysayers dogging their every action. But when this bike goes 300mph, McIntosh will be inundated with requests for my chassis design. My friend and fellow LSR racer Bill Warner has clocked speeds of over 311mph at the Loring 1.5 mile track. He is a mentor of mine and a driving force behind me wanting to achieve accomplishments of going 300mph myself. Bill is an innovator in LSR racing and has built his bike by himself, even the body work. I am not that inclined to re-invent the wheel. This is one of the reasons why I am surrounding myself with the best people is each discipline of bike building. 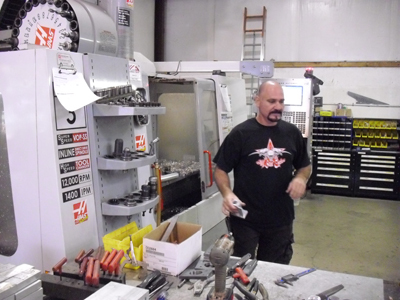 My cousin and former Pro-Mod racer Mike Caputo has his shop in Toledo, OH at Maximum Performance Cycles. He has been my teacher over the years in building every race bike I have ever ridden. But not this time. I want to follow in Bills footsteps and build this completely on my own...except for the massive help of all my friends who are involved in this build. As you can see from previous articles and the sponsor list, I think I have done a pretty good job of finding the best in the business in most every aspect of this build. the same goes for this article with the addition of Jason King from RPM Cycle Performance of Southern Arkansas and owner of Velocity Racing. 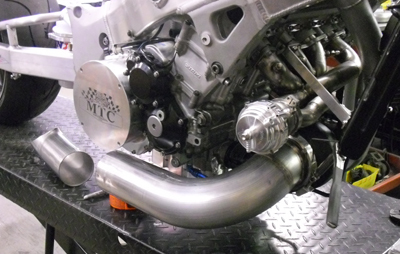 Check out the exhaust side which has a mounting flange for the 4" custom exhaust pipe! Yes, I said 4 inches. I had to re-weld and re-tap the #1 EGT port due to it being stripped out and stainless isn't an easy material to tap to begin with. I still have not found the proper way to reinforce the mounting of such a turbo to the motor so that there is no bouncing or vibrating of the turbo causing the head flanges to break off. My latest attempt will be in the following weeks when I remove a few things to make some changes before we go to the track. Hell I still have to safety wire everything and work on the fork stops and...needless to stay I still have a boatload of things I have to do before she is track worthy. Jason King from RPM Cycle Performance was our choice for the building of our custom plenum, fuel cell and custom exhaust systems. Jason inspects the naked "Flying Tiger" to calculate what materials he will need to allow our monster to be able to produce the required HP which will propel us closer and closer to our goal of 300mph in the 1 mile. Jason was tasked with the development of a plenum to my air flow specifications and manufacture and fit the fuel cell and fuel pump assembly. 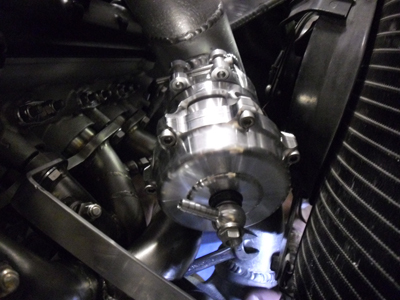 He also had to manufacture the plenum down tube, BOV install and wastegate install. I chose RPM Cycle Performance because Jason is also the owner of Velocity Racing who manufactures some of the most powerful and fastest turbo bikes known to man. His accomplishments are very well known in the racing world. A side view of the "Flying Tiger" awaiting the surgery that Jason is going to perform on her. Her long chassis and low stance already makes her look like she's going 300mph while sitting there. Jason has had years of experience building high horse power machines and his expertise is proving to be invaluable during ourextreme makeover process. A birds eye view of the "Flying Tiger" sitting alongside a Pro Street bike that Jason is completing for a customer. The fastest and quickest bikes are manufactured here at RPM Cycle Performance of Southern Arkansas. But Jason would be nowhere without his partner in life, Kristina King. Who if truth be known is a winning barrel racer. Yes a barrel racer on horseback no less. If you think your 60' times are good, you should see her on a 1 horse powered racer turning 270 degree circles around a barrel in mere fractions of a second. The entire King family is into racing in some sort or fashion. 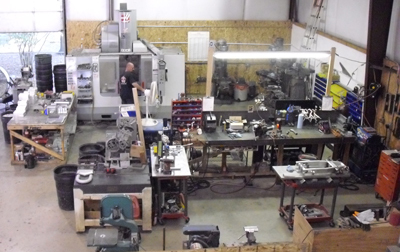 Here sits the heart of the CNC fabrication center at RPM Cycle Performance. 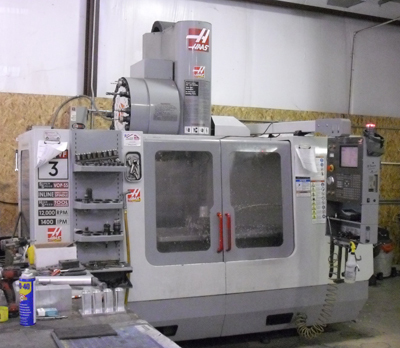 A beautiful multi tool Haas VF3 4-axis CNC machine. Jason uses this behemoth to churn out many of the parts he builds to makes his Velocity Turbo's, swingarms, fuel rails, clutch support covers and multitude of other items he makes from scratch. I want one for my garage (I mean Tiger Racing R&D facility) but I don't think it will fit down my driveway. Rats!!! The fabrication area at RPM Cycle Performance kinda looks like the Tiger Racing R&D center (garage)..NOT. There isn't anything Jason can't fab up in his shop, so when you are asking for his expertise, expect only the best from him and his crew and that's exactly what you will receive. RPM Cycle Performance is known in racing circles as one of the "go to" guys for fabrication performance. Did you know that Superbike Mike, Mike Keyte, and Jason King worked together for many years building performance bikes and motors long before many of you ever got on a bike? Jason has been in the business for many years despite his youthful appearance. 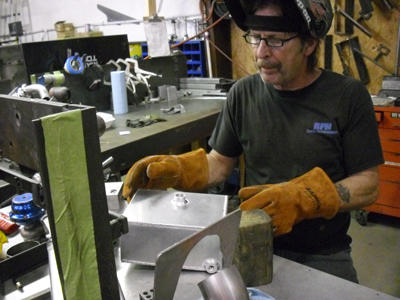 Here you can see Tony Gaudio making some parts for the custom clutch slave support that Jason is making for the "Flying Tiger". When welding up the fuel cell, all of the ports had to be in just the right spots in order for me to be able to install all the hoses and fittings and have everything line up perfectly. We are using a flow thru regulator so the spigots must be perfectly arranged to allow for the hoses to be ergonomically correct. How'd you like that word? 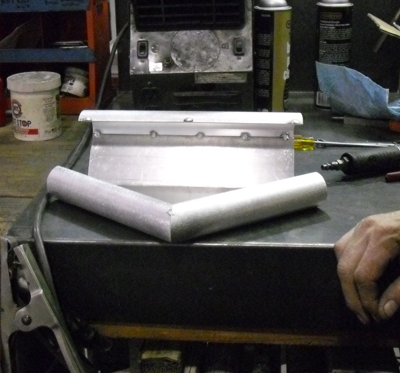 Pete Beutler (aka "Old G") makes sure that the custom fuel cell is perfectly level when mounted. This tank will hold exactly 1.09 gallons of fuel. Should be just the right amount to get down the 1 mile track at Wilmington, OH for the ECTA. Of course I have no idea if it will make it down the 1.5 mile course at Loring, Maine. Jason is discussing the mounting options with "Old G" and explains how he wants all the fittings on the tank to be installed. Fabbing together the custom plenum is performed by Pete (Old G) who is a master aluminum welder. Besides plenums, fuel cells, exhaust systems and swingarms, this man has a penchant for perfection and won't allow anything less than that off of his welding table. I swear that man could probably weld tupperware if he wanted to, he is that good. I inspected his bead welding and you would think it was a darn robot doing the work. He has a steady hand and feeds the aluminum rod with such precision that it looks as if the weld was poured as a liquid on the metal. He really impressed me and that's hard to do. The ony other men I have seen such perofrmance in welding is Terry McIntosh and my cousin Mike Caputo. Besides the custom plenum that RPM is making for us, they made a custom Fuel Rail to house the 99lb injectors from MPS Racing and a Clutch Slave Support plate that will be highlighted in an upcoming article. Building the plenum for us was a piece of cake for Jason's crew. We told them what we wanted and bingo, they made it. When these photo's were taken at the old RPM facility, Jason was in the middle of moving his entire operation to a newer facility much closer to home and his employees. Jason admires his handiwork in the manufacture and installation of the plenum while an interested customer looks on. RPM Cycle Performance has purchased Velocity Racing from Barry Henson. As racers know, Velocity is famous for producing winning swingarms and turbo kits. RPM Cycle Performance has fabricated many parts for Velocity Racing turbo kits and swingarms over the past several years, so this marriage was a natural when Barry decided to let Velocity go in order to concentrate more on his other businesses. 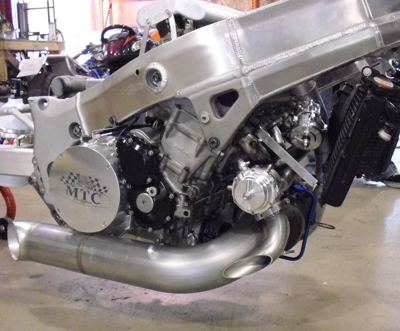 RPM Cycle Performance has all of the Velocity Racing parts, swingarms and turbo kits available and will deliver the customer service and satisfaction you have come to expect from Jason and his crew. You can see from this view that the BOV flange has not been welded up yet, but look at all that room in the front of our chassis from McIntosh Machine. 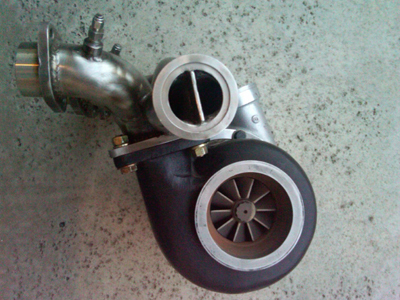 The intake tube from the Plenum also acts as a suport arm for the turbo. 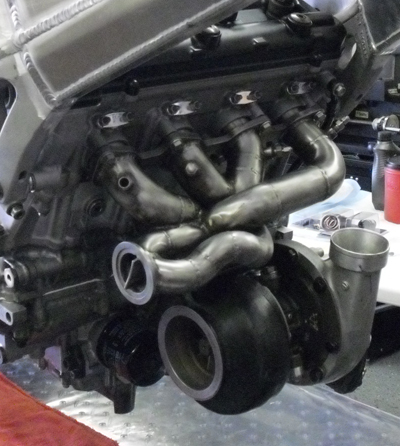 You can see the added support arms holding down the plenum. This is a safety feature Jason put on the unit in case of a massive back fire. Since my chest will be over the plenum while riding, no reason to give me a heart attack in case of such an event. Jason King measuring the needed length of pipe to be used for the custom exhaust system. How about a 4" exhaust pipe for the "Flying Tiger"? 4 inches in diameter? Holy cow, there shouldn't be any back pressure with that size of pipe for sure. 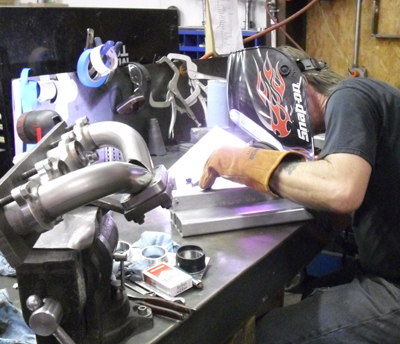 You can see "Old G" (Pete) cleaning up the turbo housing to accomodate his welding of the attachment ring for the exhaust pipe being manufactured by Jason and his crew. 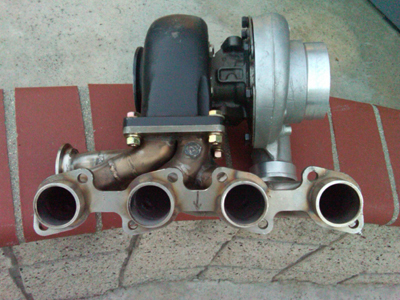 The TIAL 80lb wastegate can be watercooled and/or air cooled. We have a 6lb spring installed in the wastegate right now with extra springs to allow it to be used all the way up to 80lbs. 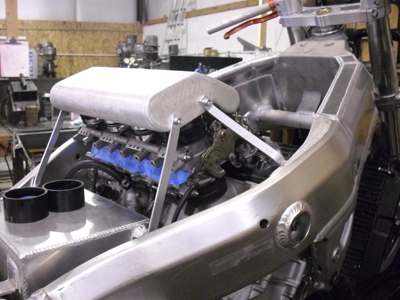 The TIAL Blow Off Valve BOV is set at 15lbs right now. When the pressure in the plenum reaches 15lbs, the BOV will open and only allow 15LBs of pressure to be sent to the TIAL Wastegate. So, 15lbs of pressure and a 6lb spring should equal about 22lbs of boost to start with. Just a few more welds and the custom 4" custom exhaust pipe will be finished. She is a beautiful work of art. Jason and his crew definitely out did themselves. The "Flying Tiger" now has the needed accessories to allow our Schwitzer S300 Turbo to do her job and give us the power needed to propel us to a blistering 300mph at the ECTA Wilmington runway. 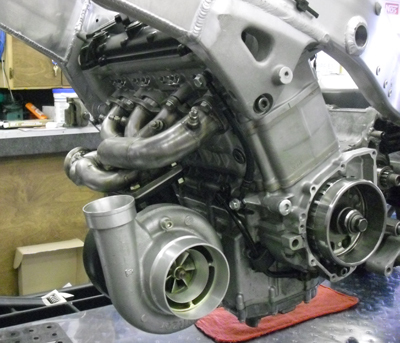 Jason gives the 80lb TIAL wastegate a final adjustment before kicking us out of his shop. is that a smirk and a slight amount of drool coming from Jason? 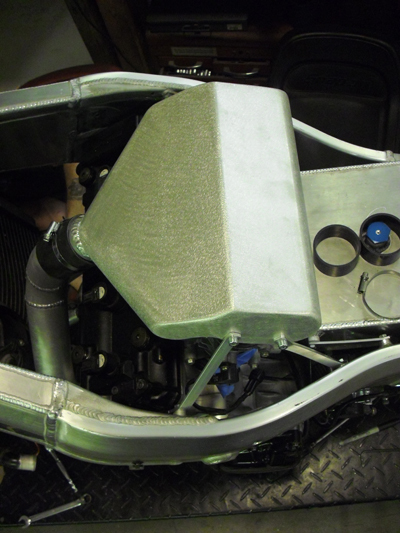 The completed exhaust system with waste gate, Blow off valve and a huge 4" exhaust pipe. 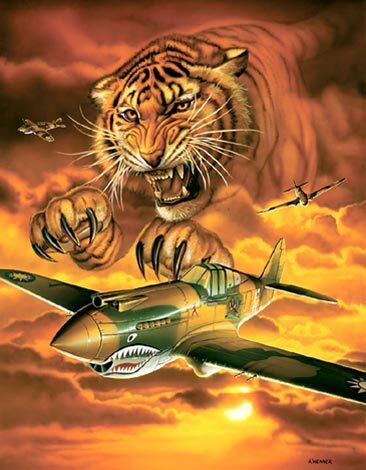 Now if my bodywork guru at Airtech Streamlining likes, he will have a work of art to begin his assembly of the new aero slick skin the "Flying Tiger" will have put on her. A special hug and thanks to my friend Jason King for all his expertise and help in building our new plenum, Fuel Cell, and Exhaust System. Now get your hand out of my wallet. Great job Jason and many thanks to his crew and hot wife, Kristina! RPM Cycle Performance now has new contact emails for your convenience. performance, installation and manufacturers info.